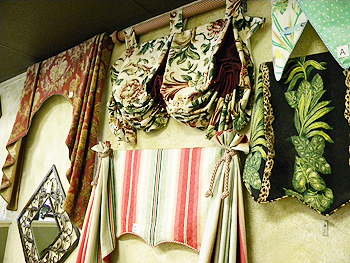 Window treatments are our specialty! Custom window treatments frame the view and make your room complete. We offer a variety of window treatment styles, all custom-made in the USA, including draperies or curtains, shades and top treatments such as cornices, valances, and swags. We have a solution to fit all your window covering needs. Our store carries a wide assortment of drapery hardware including drapery rods and finials, both modern and decorative. Real 2 inch wood blinds, faux wood blinds, custom shutters, cellular shades, pleated shades, bamboo ... we have it all!